Crafted from natural fibers and textures, Woven Woods are attractive both when lowered and when raised to form even, overlapping folds. 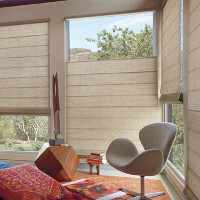 Create a uniquely custom look with a wide selection of Hunter Douglas shade styles and design options. 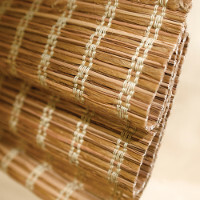 Featuring only the strongest, most durable materials and craftsmanship for superb quality and to minimize stretching, bowing, breaking and fading. Superior linings provide light control and energy-saving insulation. 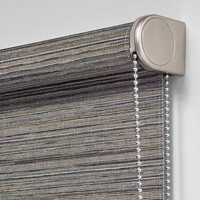 You also have the option of indepentantly raising and lowering the lining independant of the woven shade, giving you the power to adust the shades opacity. 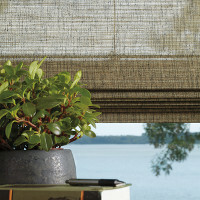 Hand-woven from versatile, light-filtering reeds, grasses and woods, our Provenance® Woven Wood Shades come in five styles and transform sunlight into captivating design statements. This style is available in Top-Down/Bottom-Up. 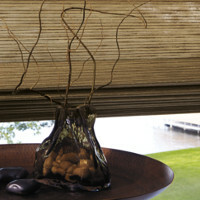 A great solution for large windows and sliding doors. 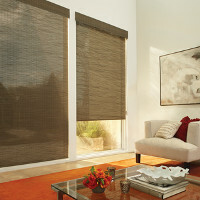 Our staff will help you choose the perfect style of window coverings based on your needs and visual style. We offer consultations at our store or in the comfort of your own home. Once you have made your selection professionals will take measurements on-site and can remove any old window coverings. 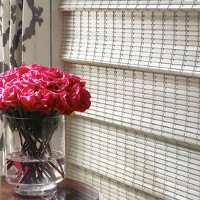 We then provide skilled installation of your new window coverings. We do it all expertly, so your windows will look amazing and give lasting satisfaction.